EA and Criterion's fun looking and criticized Xbox 360 and PS3 game would shine brightest on the iPad. Messing with a proven formula always draws the ire of diehard fans resistant to change. Happened with Metroid Prime, The Legend of Zelda: The Wind Waker and more recently, Burnout Crash! 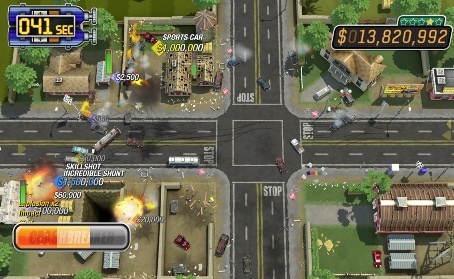 Criterion, creators of the Burnout series, chose to ditch the beautiful 3D worlds and fast paced racing in exchange for a top down Xbox Live and PlayStation Network game that blends the ever popular Crash mode with pinball, where players send a vehicle into harm's way in the hopes of destroying as many cars, trucks and buildings as possible while earning millions of points along the way. Kinect users can even play with their bodies, jumping and swiping to control the mayhem. As expected, this new take on one of the coolest racing brands of all time didn't sit well with the Burnout faithful. Last we checked, iPad owners love causing destruction. This, despite the fact that Criterion has a proven track record of hits, including last year's sublime Need for Speed: Hot Pursuit. Instead of putting faith in the company, the disgruntled masses have continued to whine about the change and how it'll tarnish an otherwise pristine IP, Burnout Legends for DS notwithstanding. To that we say, bring the game to iPad. Yes, we know there's money to be made on downloadable Xbox Live and PSN games, but come on. The first time we saw Burnout Crash! demoed, visions of playing this addictive title on Apple's tablet danced through our heads. Forget about Kinect. Instead, simply tap the iPad's screen (or perhaps give it a little shake) to blow things sky high. Burnout Crash! was originally designed for Wii, so the iPad is more than capable of running it. What's more, Apple's casual audience will appreciate Criterion's hard work more than jaded console users obsessed with the same old cookie cutter experiences. Bottom line, we respect EA's decision to support consoles, but Burnout Crash! would probably gain a more loyal following among the mobile community. Thankfully, EA will neither confirm or deny the game appearing on the App Store, so there's hope.